how to make members list directory through wordpress post custom meta key. I have created a website in which I am providing complete information about the organization. For this, I am using a Wordpress post. In which I am putting information of only one organization in a post. 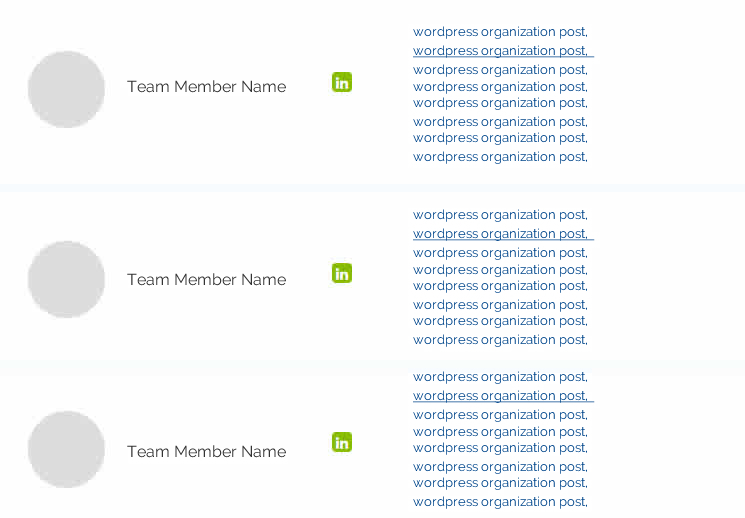 For additional information on the organization, I am doing it with a WordPress posts custom meta key. In the information of the organization, I am giving the founder, adviser, employee, office address etc. In the information of the organization, I am putting the names of 1 to 4 founders and their LinkedIn link, 1 to 24 employees' names, and their LinkedIn links, And 1 to 12 names of advisor and their LinkedIn link. I am saving all these data in a post custom meta key. I am saving all these data in one-one post custom meta key. Now I have got the entire data of one organization in all posts saved. What I Want: Now I want to display the list of those advisors and team member that are in more than one organization. I want to display all those posts in front of the list of all those Adviser names in which they also add. And in front of the name of the team or advisor, the other organization's post link is visible, clicking on that page will open the Organization page. I do not understand how to achieve this list. It took me a lot of time to write the whole question. So I hope that while appreciating my hard work you will help me find an answer to this question. I tried to find the answer from my side, but when I realized that I have not found anyway, therefore I am seeking help in this forum. If any of you can tell me the correct path, then please help me. I will be grateful to you. Note: The Linkedin link is unique in this whole data. If we filter out the LinkedIn link data, then we could probably find the way. This is my thinking, if there is any other way please help us. Again thanks to all those who have spent precious time in reading my questions. Rather than trying to find postmeta that matches (postmeta queries are typically very slow), it sounds like you would do better to work with Custom Post Types and Taxonomies. "Organization" would be a custom post type. Any people you may want to reference differently, like your examples of "Advisor" and "Team Member," would work as a Taxonomy. So for example, you would create an "Advisor" taxonomy and a term for each individual Advisor. You would apply your "Advisor" taxonomy to the "Organization" post type, so you could assign however many advisors you want to each organization, and you could then more easily query for all Advisors who are assigned to multiple Organizations, listing the links to each Organization on the side as in your screenshot. Not the answer you're looking for? Browse other questions tagged wp-query custom-field post-meta query-posts meta-query or ask your own question. How to obtain a group of post meta and assign each meta to other variables? how to get all post with the same post meta? Create ul list in Custom Meta Box? How to hide meta box values from custom fields list? How to receive all the meta information of a post ?